Playing Time: 15 - 30 min. Get your eyes warmed up cause you're going to need them in the fun and hilarious game of Wink. A great party game for younger kids and adults alike. There will be plenty of awkward stares and suspicious glances as you try to catch someone in the act of winking. 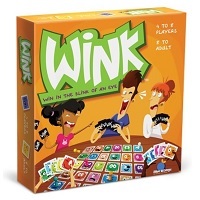 The game Wink is a blast to play with your friends and family. Players try to catch other players "making a move" as they try to wink at their new secret partner. Get caught and you'll loose a point. This fun game has simple rules and an easy concept but will have you wanting to play it again and again. Try playing the game wink at your next party! Try to not get caught winking at your different partners through out the game and score the most points. Your game of Wink will come with 2 decks numbered face cards, 32 accuse cards, 8 player cards, 8 player tokens and the official Wink game rules and instructions. Please keep in mind that the official Wink party rules and instructions could be different depending on the game version you have. The rules below are some of the exact directions on how to play Wink. Share with us your comments, funny stories, tips, advice, strategies, creative ways to play, questions about how to play, problems with the rules or anything you want about Wink. All submissions will be reviewed within 24 hours. Click here to add your Wink comments. Played this game as a group date for a dance. We all had a blast. We simplified the rules a bit and explained them really quick. Fun and easy game to play. What a fun game. We played Wink at a family get together and we were laughing our "eyes" out. The kids were having a blast and the adults were getting into. The game was easy to explain how to play and there weren't any complicated rules. The instructions are very clear and we were off and playing in no time. Wink is definitely a great game to play for all ages.